La Belle et la Bete was made in 1946 and it is a film adaptation of the novel Beauty and the Beast. 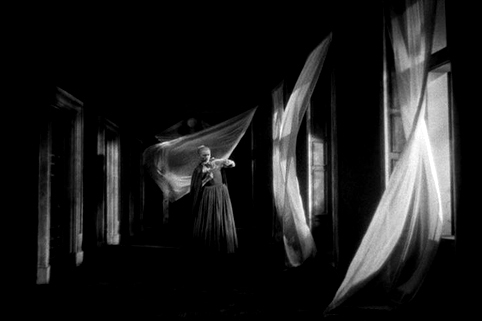 It was directed by Jean Cocteau who was a French filmmaker and poet. The main stars of the film are Jean Marais as the Beast and Avenant, and Josette Day as Belle. The film suggests an underlying theme of sexual desire "before she has even seen him, she is aroused to her very depths, and a few seconds later, as she tells him she cannot marry--a Beast!--she toys with a knife that is more than a knife" (Ebert, 1999) and throughout the film there are many other moments where sexual desire is accentuated through costume or dialog. The themes of sexual desire explored within the film could also be linked to the fact that Jean Cocteau was a poet and he used this skill to add a new depth and to tell the story. 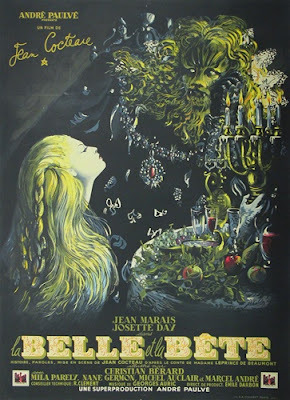 La Belle et la Bete shows Belle to be drawn to the Beast and she almost seems to have no control over herself or her own desires "As Belle first enters the Beast's domain, she seems to run dreamily a few feet above the floor. Later, her feet do not move at all, but she glides, as if drawn by a magnetic force" (Ebert, 1999) shown in figure 2, this shows her to give up her control to the Beast, as if she is giving up control to the idea behind male strength and protection. The Beast says throughout the film that if Belle were to leave him then he would die from grief, this is very controlling and a high form of manipulation which helps to show that the film is dated as it shows old ideals and views that woman should live to serve men and fulfill their commands. The film uses costume and make-up to create interesting characters and to add depth to the story. The make-up of the Beast is done extremely well and it works to accentuate the character type and the way that his appearance controls him "Belle is by comparison a fairly dull figure, despite Josette Day’s beauty, but the ambiguities of her attitude toward the Beast do add interest and complexity to the character" (The Pandorian, 2009) in the end the costumes show the identities of the characters as the Beast is shown to be wearing clothes that symbolize power through the accentuated shoulder pads and the cape like clothes, where as Belle is in dainty dresses that flow and almost dance as she moves which empathizes her feminism. Ebert,R. 1999 Beauty and the Beast 1946. The Pandorian. 2009 La Belle et la Bete. Anyway, I've had a look back through, and overall, it looks like you are producing thoughtful reviews. Bear in mind when you are writing them, the underlying theories that you have been learning about in contextual studies, and try and apply some of these ideas to your discussions. Also, consider the project that you are working on at the moment; for example, you could have discussed the influence of the production design on the final visual outcome (how Christian Bérard's chalky drawings translated into the look of the film, for example). Figure 1. Nylon Fashions. (1959) From: Nylon Fashions, British Pathé. Directed by: unknown. [Film still] Great Britain: British Pathé. At:http://www.britishpathe.com/video/nylon-fashions (Accessed on 20.03.12).